THE PENAL DIGEST INTERNATIONAL: This newspaper-format digest (monthly) is published and edited in Iowa City by Joe Grant. 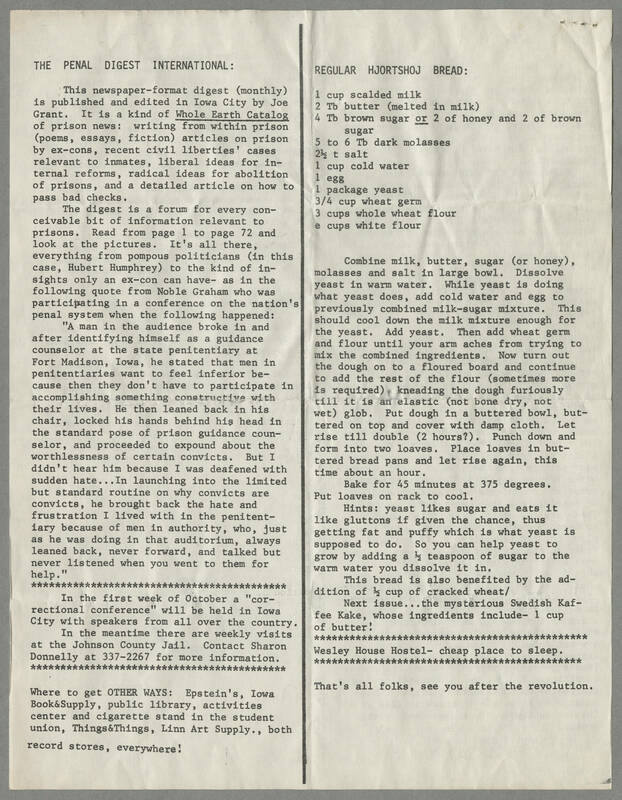 It is a kind of Whole Earth Catalog of prison news: writing from within prison (poems,essays, fiction) articles on prison by ex-cons, recent civil liberties' cases relevant to inmates, liberal ideas for internal reforms, radical ideas for abolition of prisoners, and a detailed article on how to pass bad checks. The digest in a forum for every conceivable bit of information relevant to prisons. Read from page 1 to page 72 and look the the pictures. It's all there, everything from pompous politicians (in this case, Hubert Humphrey) to the kind of insights only an ex-con can have - as in the following quote from Nobel Graham who was participating in a conference on the nation's penal system when the following happened: " A man in the audience broke in and after identifying himself as a guidance counselor at the state penitentiary at Fort Madison, Iowa, he stated that men in penitentiaries want to feel inferior because then they don't have to participate in accomplishing something constructive with their lives. he then leaned back in his chair, locked his hands behind his head in the standard pose of prison guidance counselor, and proceeded to expound about the worthlessness of certain convicts. But I didn't hear him because I was deafened with sudden hate ... In launching into the limited but standard routine on why convicts and convicts, he brought back the hate and frustration I lived with in the penitentiary because of men in authority, who, just as he was doing in that auditorium, always leaned back, never forward, and talked but never listened when you went to them for help." In the first week of October a "correctional conference" will be held in Iowa City with speakers from all over the country. In the meantime there are weekly visits at the Johnson County Jail. Contact Sharon Donnelly at 337-2267 for more information. Where to get OTHER WAYS: Epstein's Iowa Book & Supply, public library, activities center and cigarette stand in the student union, Things & Things, Linn Art Supply., both record stores, everywhere! REGULAR HJPORTSHOJ BREAD: 1 cup scalded milk 2 Tb butter (melted in milk) 4Tb brown sugar or 2 of honey and 2 of brown sugar 5 to 6 Tb dark molasses 2 1/2 t salt 1 cup cold water 1 egg 1 package yeast 3/4 cup wheat germ 3 cups whole what flour e cups white flour Combine milk, butter, sugar (or honey). molasses and salt in large bowl. Dissolve yeast in warm water. While yeast is doing what yeast does, add cold water and egg to previously combined milk-sugar mixture. This should cool down the milk mixture enough for the yeast. Add yeast. Then add wheat germ and flour until your arm aches from trying to mix the combine ingredients. Now turn out the dough on a floured board and continue to add the rest of the flour (sometimes more is required) kneading the dough furiously till it is an elastic (not bone dry, not wet) glob . Put dough in a buttered bowl, buttered on top and cover with damp cloth. Let rise till double (2 hours?). Punch down and form into two loaves. Place loaves in buttered bread pans and let rise again, this time about an hour. Bake for 45 minutes at 375 degrees. Put loaves on rack to cool Hints: yeast likes sugar and eats it like gluttons if given the chance thus getting fat and puffy which is what yeast is supposed to do. So you can help yeast grow by adding a 1/2 teaspoon of sugar to the warm water you dissolve it in. This bread is also benefited by the addition of 1/2 of cracked wheat/ Next issue . . .the mysterious Swedish Kaffee Kake, who ingredients include- 1 cup of butter! Wesley House Hostel - cheap place to sleep. That's all folks, see you after the revolution.